Processing EMV payments in NetSuite is easier and more secure than ever with Solupay for NetSuite SuitePayments. There are some cases where SuiteCommerce InStore, or another fully functional POS is not a requirement, but there is a desire to accept face-to-face credit card payments with NetSuite ERP. With Solupay, EMV payments can be processed directly within core NetSuite, or NetSuite ERP, providing much lower credit card processing rates because the card is present. Our certified P2PE (point-to-point encryption) solution provides payment security that instantaneously converts confidential payment card data into indecipherable code, maximizing the security of payment card transactions. The transaction is encrypted at the device level, taking the company’s retail payments out of PCI scope since the card holder data never touches the company's local network. This capability gives merchants the ability to accept EMV, chip card, or Apple Pay payments with greater ease, security, and efficiency, as well as reap the benefit of eliminating chargeback liability that EMV provides. For NetSuite customers not using SCIS that require face-to-face transactions, this solution is ideal. For warehouses, distributors, and businesses who do most of their orders online or over the phone, but still require a way to take payments in person, accepting EMV within core NetSuite is wise. Processing payments through this method eliminates the costs and overhead that additional systems would require. 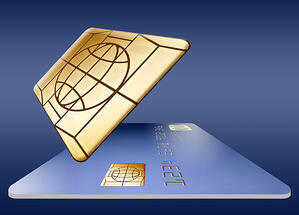 Solupay's EMV in NetSuite's ERP guarantees card present transaction rates. Other solutions on the market for NetSuite claim to offer a card present, or “swiped” transaction, within Core NetSuite, but the rates associated with these solutions are Card Not Present rates, which carry a higher cost. To learn more about working with Solupay to accept EMV in NetSuite ERP, contact us HERE.